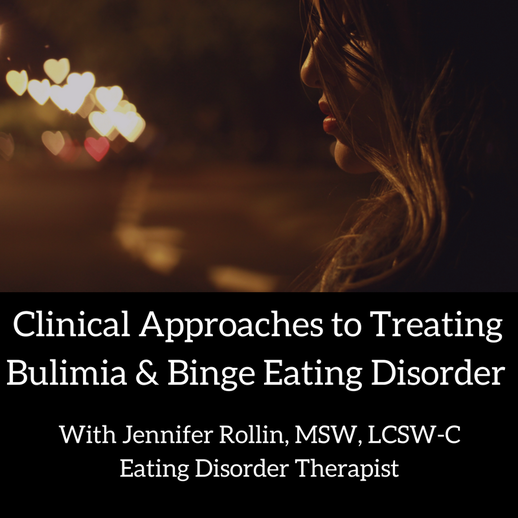 "I just finished this wonderful training by Jennifer Rollin! If you’re a provider or student looking to increase your skills and knowledge of working with people with bulimia and BED, this is the place to go! Jennifer includes so many helpful tips and strategies in her 78 minute video. BONUS: You also get multiple worksheets to use with clients! Thanks for sharing your passion, Jennifer!" "Your trainings as super helpful for me a clinician! I use them for myself and recommend them to my clients all the time. Thanks so much for all the work you do!"